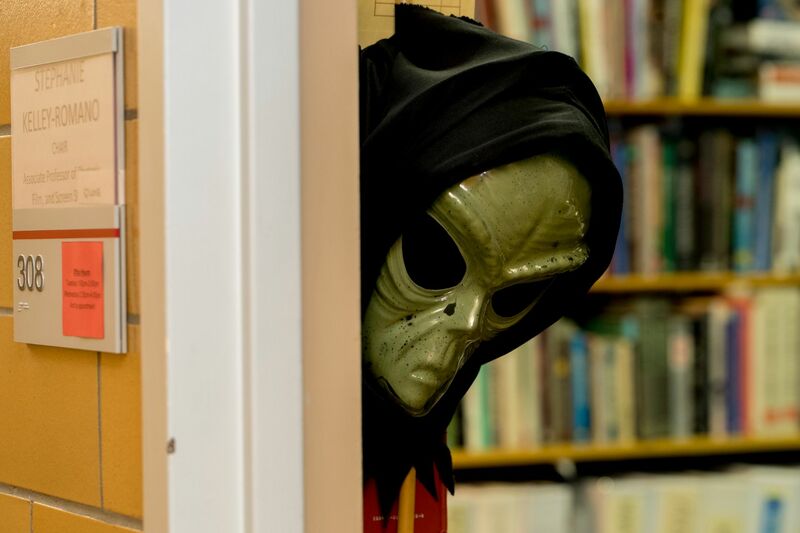 Walk into Associate Professor of Rhetoric, Film, and Screen Studies Stephanie Kelley-Romano’s second floor Pettigrew office, and you’ll enter an alien environment. Not that it’s strange or different from other faculty offices. Rather, it’s filled with objects connected to alien beings. Kelley-Romano, who teaches rhetorical theory and criticism, wrote her doctoral dissertation on “The Myth of Communion: A Rhetorical Analysis of the Narratives of Alien Abductees,” in which she drew from 130 interviews with people who believe they’ve been abducted by aliens. 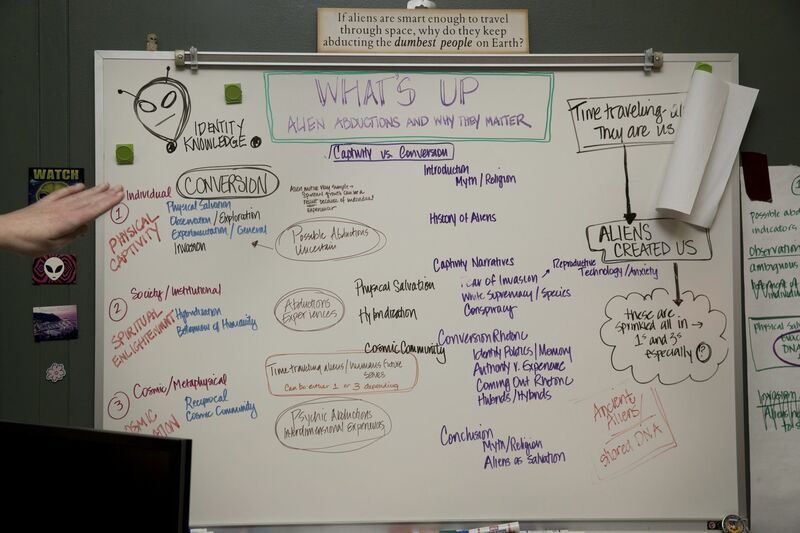 One of her conclusions is that people who believe they’ve been abducted have woven a collective myth that acts as a kind of religion, and she’s at work at turning the dissertation into a book, What’s Up: Alien Abductions and Why They Matter, the outline of which appears on her office blackboard. 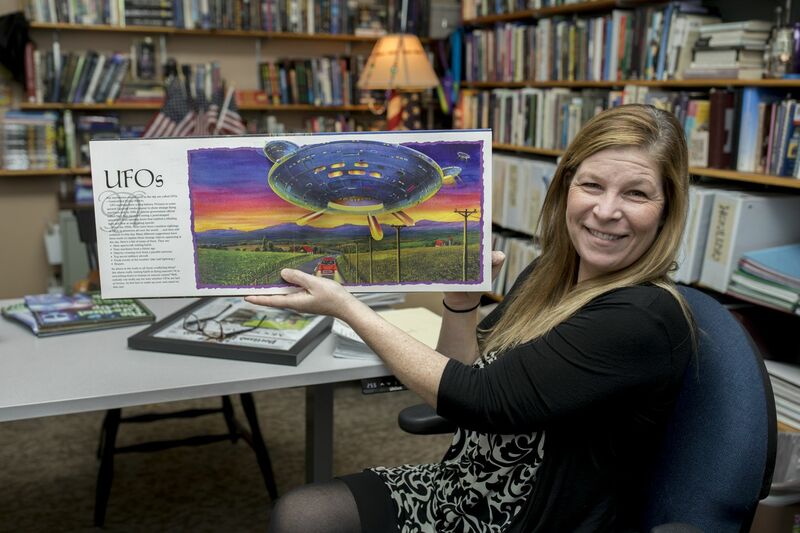 Today, Kelley-Romano’s calling out a favorite pop-up book, Alien World: Fact or Fiction, that includes three-dimensional paper presentations on aliens, UFOs, and the supposed 1947 UFO crash at Roswell, N.M., which birthed a wide variety of conspiracy theories about alien spaceship landings. 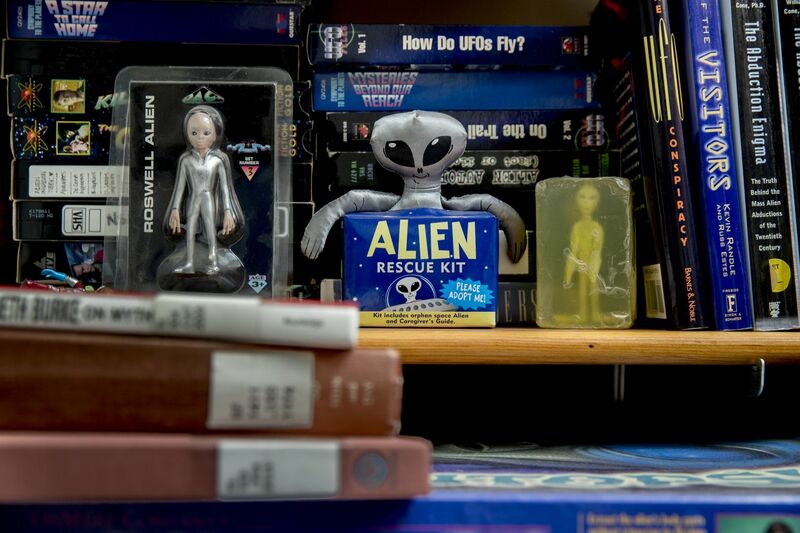 This particular book, like many of the UFO-themed collectibles in her office, are gifts from her students, some of whom have taken the course she teaches on the rhetoric of alien abduction. “Bates has incredible academic freedom in terms of what we can teach,” she says. After offering the course, she began to receive gifts from students, often from study abroad locations, who would discover all kinds of curiosities: alien root beer, condoms, rolling papers, dolls, soaps, and salt and pepper shakers, to name a few. Her gifts include non-alien items, including a piece of the University of Kansas basketball floor — she’s a huge Jayhawks fan — and whatever the gifts, they often come from students with whom she enjoys longstanding connections. “It’s a reminder, an acknowledgement of the fondness we have,” she says, “of the relationships that I’ve created and maintained for almost 20 years now.” She remembers how the mother of a student in her alien abduction course years ago quilted an alien blanket for her newborn son, who is now 16. 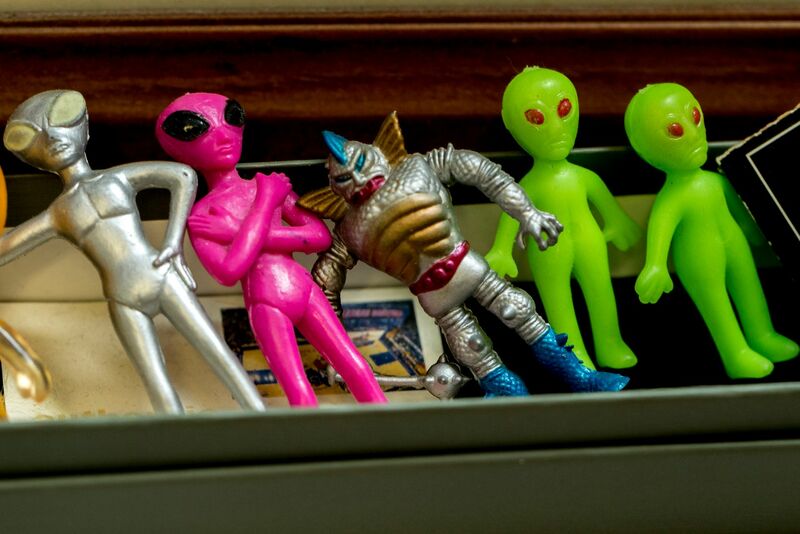 Students often arrive in her classroom with one question: Does Kelley-Romano actually believe in alien abduction? Subsequently they learn to ask better questions about how we create our belief systems. “Alien abduction functions as a system of beliefs that offer a larger kind of metaphysical grounding,” she says. “When students take that understanding and apply it more broadly to systems of belief that are created through narratives and stories, they’ll consider why we believe some stories and not others.” They learn to critique and assess different arguments, including conspiracy arguments, how they work, and how we combat them —a legitimate skill sadly necessary for their generation. Kelley-Romano loves watching her students move “from a place of bemused skepticism to the recognition of this is how we create truth.” They spread their wings, set off to new universes, but their lives remain linked. And the gifts arrive.